Perfect as part of the latest layering look or as a subtly beautiful everyday bracelet, this sterling silver bolo bracelet has charm and class in abundance. With a pretty rose gold plated heart at its centre, you will forever be able to wear your heart on your sleeve. Silver Rose Gold Plated Heart Adjustable Bracelet is rated 4.8 out of 5 by 6. Rated 5 out of 5 by Anonymous from Looks so much nicer than the photo. 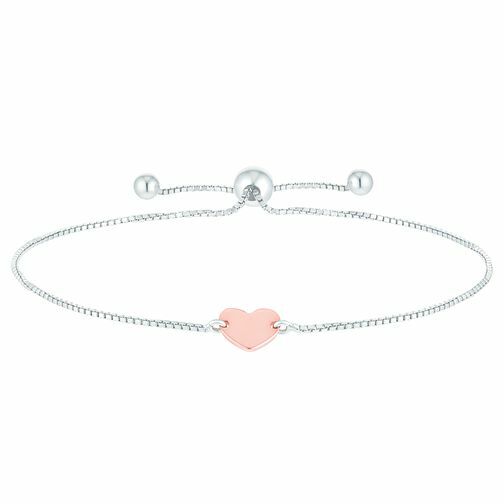 The heart looks so delicate, simply stunning bracelet. Rated 5 out of 5 by Anonymous from Such a beautiful good quality product This is my first purchase from h Samuel and I am very happy with my bracelet.